The goal of this project is to develop a dedicated microfluidic platform for experimentation on BLMs and on membrane proteins. In such a system, the two large fluidic reservoirs found in conventional set-ups and placed on both sides of the substrate containing the micrometer-sized aperture are replaced by two microfluidic channels, with a smaller capacity (nL-range). The use of a microfluidic system for such experimentation presents a number of advantages. Firstly, the BLM is horizontal and the space below the BLM is reduced, which enables to couple the standard electrical measurements to optical characterization. High resolution imaging is also possible, providing the bottom channel is shallow enough. In microfluidic channels, solutions and chemical can easily be flushed to refresh the buffer solution, add a protein solution or flush drugs on the membranes. The experimentation becomes dynamic and all fluidic aspects can be automated. The consumption of buffer and chemicals is also dramatically lower as the capacity of the device is reduced, which greatly decreases the experimental costs. In addition to this, most of the time, the aperture that contains the BLM is smaller than in conventional set-ups: the BLMs are subsequently more stable, the electrical noise level decreased and the reduced membrane surface area is more suitable for single protein studies. Finally, microfluidic devices are characterized by a high level of integration; a single device can contain a number of independent measurements sites for multiplexed analysis. Both the multiplexing of the experiments and their automation offer the opportunity to perform high-throughput measurements on membranes, but also more interestingly on membrane proteins. 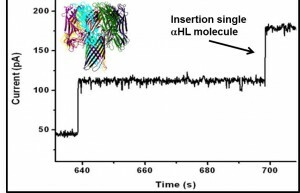 This last aspect is particularly interesting for the pharmaceutical industry which is in search for high-throughput platforms for drug screening, notably on membrane proteins that have currently become their favorite targets for the development of new drugs. 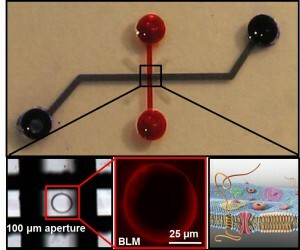 Top: Picture of the microfluidic device whose channels are filled with a red dye. Bottom left: Enlarged view on the intersection of the microchannels and the micrometer-sized aperture where BLMs are made. Bottom right: Fluorescence microscopy picture of a BLM prepared in situ in the microdevice. The dark area in the middle corresponds to the bilayer area while the fluorescent ring corresponds to the annulus of the BLM. Single protein studies in a microdevice. α-hemolysin (inset) is employed as a model for membrane proteins. 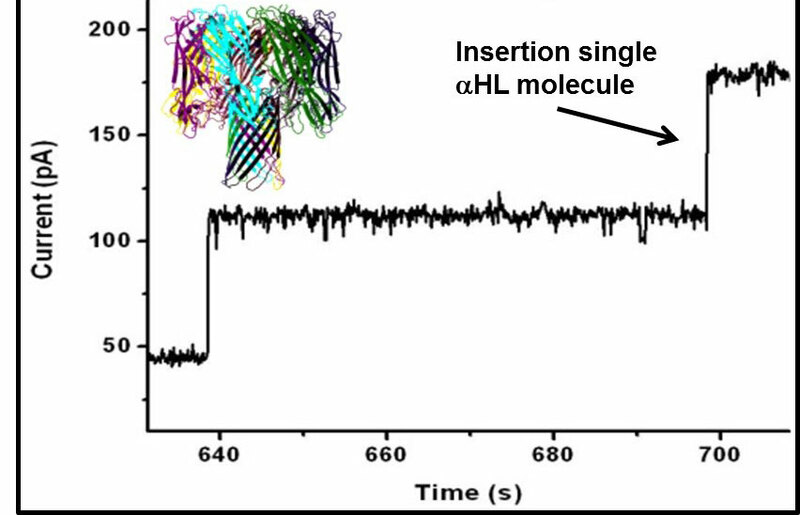 A solution of the protein is added in one microchannel after formation a BLM has been in the micrometer-sized aperture. The protein inserts spontaneously in the membrane, and every protein gives rise to a characteristic jump in the current. (50 pA if a voltage of 50 mV is applied across the membrane, 1M KCL buffer). Potential applications of such integrated microfluidic platforms for BLM experimentation are: (i) fundamental studies on cell membranes and their properties to for instance better understand which parameters in the membrane are influencing the process of pore formation; (ii) studies on membrane proteins of pharmaceutical relevance or for characterizing engineered proteins; and (iii) drug screening for channelopathies (e.g., cystic fibrosis).